After a rather long and arduous search, I finally found a tsukemen restaurant that rivals that of the famous Menya Itto. I’ve always heard about Michi being rather good and is always in the top 5 in tsukemen rankings over on tabelog.com, but because of how far it is from both my office and home, I had been hesitant to make the trip. I am definitely glad I did however, as this was well worthy of its popularity. The tsukemen here was so good I may have to edit, or make a new, top 5 list for tsukemen this year…it’s that good. Trained at the famous Mendokoro Honda in Jujo, Michi had the pedigree to open a ramen restaurant before he even began. 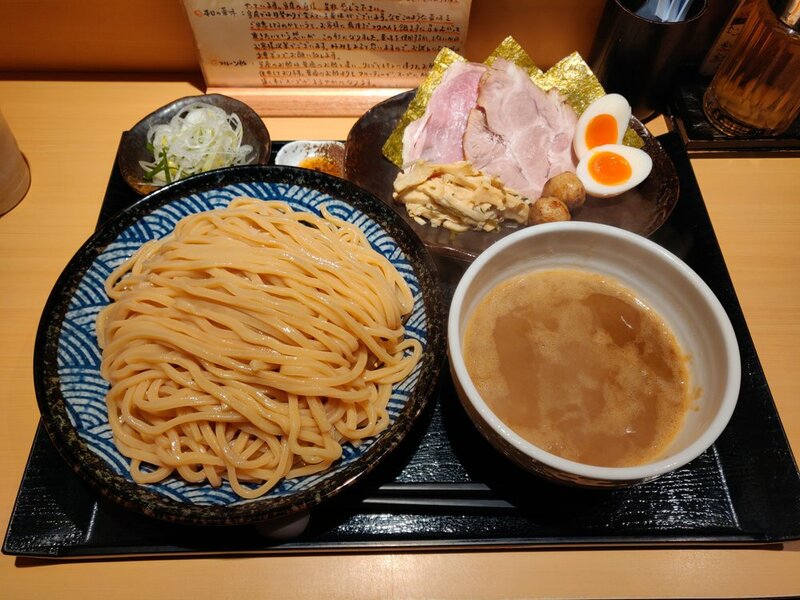 However, to go after a popular ramen variety in tsukemen required a good level of confidence…especially so as he began this shop at the ripe young age of 24. The risk paid off and the tsukemen here is well worth taking time out of your schedule for. Tsukemen Michi is just a short five minute walk from Kameari station on the JR Joban line, about 40 minutes from Shinjuku station. The regular menu is available Wednesday to Sunday from 11:30 until the soup runs out (usually 19:00). Michi is closed on Mondays and has a specialty Shio (salt) tsukemen on Tuesdays. Michi is a buy your ticket first shop, but the shop staff will let you know when to purchase your ticket so if there is a queue outside, make your way to the end until he comes to speak to you. If you’re in need of an English menu, ask for it when he comes to speak to you. If you’d like to see the ticket machine before you enter so you’re prepared, here are the translation of the buttons. Starting with the white buttons on the top row is their famous Tsukemen starting with the basic (comes only with green onion and Japanese Herbs, no char siu or egg), regular Tsukemen (standard toppings with green onions, herbs, char siu, eggs, bamboo shoots, dried seaweed), and Tokusei (extra toppings). The blue button on the right is the omiyage, or take home tsukemen. The green buttons on the second row is the size options for your tsukemen going from +100g, to +200g, +300g, and +400g. The far right is -50g, but includes a creme brulee dessert. Third row is the creme brule, beer, and oolong tea. The other buttons below are for specialty menu items and rice, but is rarely ever offered. If they are, ask the staff for an explanation of the buttons that day. If you get the extra noodles for your tsukemen, a free refill of your soup will be offered so slurp away without worrying about portioning out your soup. I opted for the Tokusei Tsukemen (extra toppings) with a regular portion for noodles. I highly regret not getting extra as I definitely would have loved more soup just to have because it was so delicious. Once you have your tickets purchased, the staff will take them from you while in line so that they can prepare your bowl before you sit. Once a seat opens, a staff member will walk you in to the shop and seat you at the counter. Michi typically seats customers in rounds so that you won’t be waiting too long at the counter for your meal. I was so surprised at Michi’s attention to customer service. Tsukemen Michi is the definition of Omotenashi, or Japanese hospitality. As you wait for your meal, the owner meticulously explains the tsukemen to you. First he sets the tray and carefully places the chopsticks down. Next he’ll assemble the toppings for your order and place them on the tray before washing and cooling the noodles. Once the soup is properly heated, he’ll hand you the tray all in one go. The Japanese herb toppings you see on the upper left corner is changed daily based on the market that day and he’ll explain how to use each as you eat your bowl. On this day it was a collection of organic long green onions, Japanese ooba herb, as well as a sesame seed oil with salt taken from Northern Japan and a bit of black sesame seeds. Toppings for my Tokusei Tsukemen were a slice each of sous vide char siu and roasted char siu, menma bamboo shoots, chicken meatballs with yuzu, dried seaweed, and a half boiled egg. The soup is made with a blend of pork bones and a variety of dried fish. The recipe is similar to that of Itto and has a similar rich, creaminess without the bitter smell you usually get from a deep pork bone broth. The tare, or seasoning sauce is shoyu based and is a bit more subtle than most tsukemen restaurants. 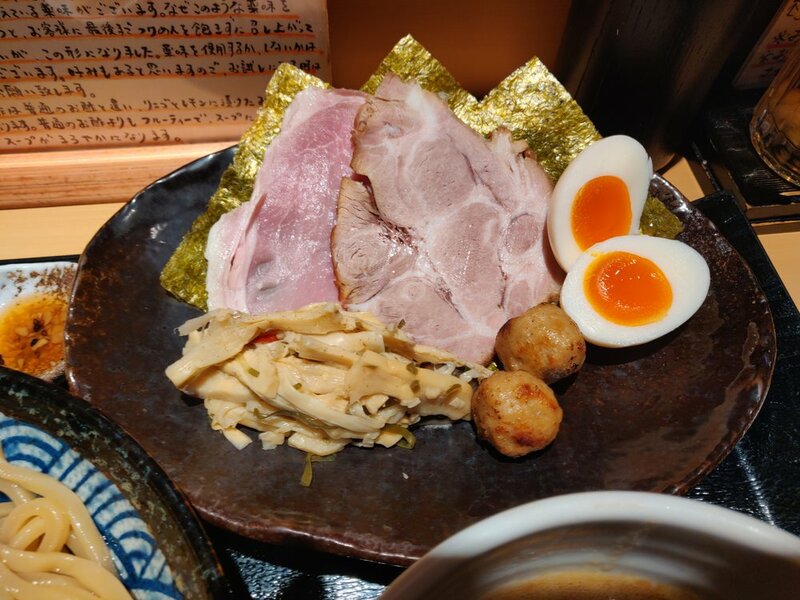 It brings out the pork bone punch and the umami flavors of the dried fish. A subtle sweetness comes through from the carrots and other vegetables used in the broth simmering process which was a delight. I found it to be a perfect balance in the blend of savoriness, saltiness, creaminess, and sweetness. The soup isn’t too thick, but is creamy enough to coat each layer of noodle with every dip. Noodles are quite thick and chewy cooked perfectly to keep its texture in tact. After cooking, the chef shocks the noodles in an ice bath so it doesn’t sit there and cook from the residual heat while you dip the noodles in the soup. A bit of wheat flour is used and the nuttiness of the wheat comes through with each bite. While it is thick, its not an overpowering flavor so it works well with the soup while still giving you the subtle fragrance that makes even eating the noodle by itself enjoyable. The meat toppings were amazing and had the right balance of meatiness and fat to match the soup. The yuzu, Japanese citrus of the chicken meatballs helped cut through a bit of the fattiness of the soup and made for a zesty flavor change. The pork char siu slices have a variety that keeps your taste buds second guessing. The marinade isn’t that powerful and the sous vide version soaks up the flavors of the soup well. The roasted version has the distinguishable maillard reaction around the edges and gives a roasted flavor note. The egg is half boiled rather than soft boiled so that the yolk isn’t creamy and mixes with the soup. I usually prefer a soft boiled egg, but the chef’s explanation made a lot of sense and I enjoyed the thought he put, even as subtle as the cooking method of the egg. Mid way through the noodles, the chef suggests you add the Japanese herbs to change up the flavor and dip the noodles in the sesame seed oil before dipping in the soup. The change in flavor that these two brings is incredible to say the least. The nuttiness of the sesame seed oil adds a different layer to the soup and the fresh Japanese herbs makes it very refreshing. Like I said before, my only regret with my meal at Michi is not ordering more noodles so I can get a refill of the soup. My entire meal was thoroughly thought out by the chef and the explanations from him made my tsukemen incredibly enjoyable. I can’t say enough about Tsukemen Michi and hope that you all make a visit soon. I definitely think its on par with Michi and Tomita in Chiba, but without the hassle of the long queues. If you make a visit, let me know via my social media platforms or in the comment section below. Hope to hear your thoughts!